Hi everyone and thanks again for your support, there is an extra special window today, but more of that later, he! he! It's question time again, have you decided on a New Years Resolution yet and what will it be? Thats not to painful is it? just leave your answer at the bottom of this post and check back tomorrow after 00:01 GMT to check whether you have been lucky. Well I have teased you enough, tonight Katharina has asked me to offer 3 - yes thats right - 3 of you a chance to win the fabulous Whiff of Joy Charlie Bond Stamp. The 3 winners will be chosen at random as usual just before Midnight GMT tomorrow, so to be in with a chance to win this awesome stamp don't forget to leave your answer to todays question below and check back tomorrow after 00:01 to see if you have been lucky. The winner of yesterdays cute Herb stamp chosen by Random.Org is No 158 that is Desiree from Kort og godt, congratulations Desiree can you please e-mail us you address so we can get Herb in the post to you. My new years resoution is to finish each card I make before moving on to the next one - by decorating the insides. I've just spent days doing inserts and decoration for batches of Christmas cards I made earlier this year. Hi! Thanks for a chance to win this great stamp. My New Years resolution is to go to bed earlier and find a job in Tourism, finally. ohje Vorsätze fürs nächste??? Mehr das Sportstudio besuchen. I love this stamp! He's one of my favs. I don't make resolutions, but I want to get published in a stampingmag next year. I'd also like to be on a DT. I will definately try to make it happen in 2009! My New Years's resolution is to make more time for me. I am always busy doing for others, which is good, that I run out of time for me. Charlie on today's post reminds me of Bond. My New Years Resolution is to show my husband and friends how much I appreciate them more often - and to start my Christmas cards earlier! WOW...Katharina is so thoughtful and giving to be giving 3 lucky people a 007 Charlie stamp! I would love to get this little guy in my collection...so i can make some New Years cards with him! As for my New Years resolution...to devote more time to my crafting hobby than playing on the internet....don't know how successful that will be! hee hee! ui wieder so ne tolle karte! vorsätze fürs nächste jahr?hm gute frage....auf jeden fall mehr auf meine gesundheit zu achten und mehr sport zu machen! wünsche euch allen einen schönen 3.advent! I know it sounds like a cop-out, but I don't make New Year's resolutions. I never kept them so I just stopped pretending. I do want to tell you that I have enjoyed seeing all the gorgeous projects that you have shared! What a fabulous card. He is adorable, would be great for graduation or groom, love his tux!!! Charlie looks great and ready to celebrate! My New Year's resolution is to be more faithful to my blog. I will aim for at least twice a week. My New's Year Resolution is to keep a Journal. My news year resolution is to live better. It entails alot but I'm tired of making the same one every year. Fabulous card!! Love that stamp!! I don't normally make resolutions but I do want to start the year off on a btter foot - eating better & getting some more exercise would be top of the list!! Wow! 3 chances to win!! That is GREAT! Now that you got me thinking about my new years resolution. I really need to start reading more cookbooks to get inspired! I don't enjoy cooking and I really wish I did, so that is something I really need to work on. My two biggest resolutions are to be healthier (I've already started working hard on that) and to really kick-start my buisness! Thanks so much- he's so sharp! My New Year's Resolution is to lose the weight I gianed after having my son, 2 1/2 years later!! I wonder if I can make a card while jogging around the block!! LOL Oh, well, thanks for a chance!! I do not make New Years resolutions. I have a few goals in 209 however. I would like to hike at least 450 miles, finish at least 50 scrapbook pages and 200 cards. My new year's resolution is to actually use all of my stamps, papers, embellies, etc. I love to shop for new goodies, but don't use them nearly enough. I also hope to update my blog more frequently. Great card using a great image. Honestly I have not even thought about a New Year's resolution yet. But now I will be thinking about it. mine is to finally learn to drive!! i have not really resolutions, i always want to do my best. But because last year i was ill so often, i will do all i can to have not so much stress next year. I am not one to really believe in new years resolutions. I believe if I want to accomplish something in my life today is the day to do that and that I should not wait until the first day of the new year to start something. However, I am about to get back on my weight watchers restructuring of my eating habits (how is that for not calling it a diet??!! LOL) so I can take off the rest of my weight in 2009 so if you want to call that my resolution, so be it. My new years resolution is to be stronger within myself and stand up for myself more often. My New Years Resolution will be to be more organised. ich habe mir noch keine gedanken gemacht über die Vorsätze fürs nächste. My New Years resolution is to find more free time for my creations! oh wehhhhhhhhhhh die Vorsätze fürs neue Jahr bis jetzt hat das noch nie geklappt leider aber ich hoffe das ich das Rauchen mal sein lassen kann. No, I have stopped making new years resolutions because I can never keep them.. *lol* So I wonät give one this year either.. I just finished my very first Whiff of Joy Card this week! I love your stamps, and have a 4 year old Daughter named Willow so they are for her for Christmas, but I get to use them too!!!! I have been stalking Whiff of Joy for a long time, and love, love, love them!!! I was soooo excited to see my first WoJ card met this weeks challenge over at the Challenge blog Yea!!! My New Years Resolution is first to play with my kids every day (not that I do not anyway as a SAHM, but to have lots of fun with them as they grow way to fast, and to STAMP every day!!! I have come much closer since I started blogging a coupld of months ago, but still need some work at making it happen every day!!! Spend more time creating rather than blog hopping might be a good one. Your card is fantastic and this little Bond guy is just so cute. Die Karte ist ebenfalls ein Traum! was für ein schöner Stempel und ein süßes Kärtchen. Ich bin im Moment vorsatzlos, da es meist immer anders kommt. My New Years resolution is to start my master education to become a higher qualified teacher. My New Years Resolution is to manage my blog at least weekly. Not sure about a new year's resolution .... I gave up smoking around 6 years ago, I eat more heathily and have lost nearly 2 stone since joining Weight Watchers and I dont drink .... so whats left lol?! und der Stempel ist total süss. Hallo und Danke fuer eineweiter Chance einen tollen Stempel zu gewinnen! Ich hab mir vorgenommen im naechsten Jahr etwas mehr im Haushalt zu tun, etwas mehr mit meinen Kindern zu spielen und etwas weniger "Me-Time" zu beanspruchen... Die Kinder sind nicht mehr ewig so klein und ich krieg immer noch genug Zeit fuer mich.
Hallo und Danke fuer eine weitere Chance einen tollen Stempel zu gewinnen! der charlie ist toll...der fehlt mir auch noch. da versuche ich doch gerne mal wieder mein glück. Die Karte sieht toll aus, eine ichtige Männerkarte. Damit tue ich mich immer schwer. So richtige Vorsätze für das nächste Jahr habe ich nicht... weiter angestrengt nach einem Job suchen. hi, my new years resolution is to be more orginzed,i'm always in a hurry i always leave things till the last possible minute. Stunning card & Charlie Bond looks real dapper, I bet he makes heads turn wherever he goes. I have never won any blog candie, so I have everything crossed and good luck all. Cute guy stamp,new years resolution would have to be to lose a bit of the dreaded weight gain. Thanks for another chance. My news year Resolution is to try to use up all my pieces of spare paper I ahve a box on my crfat table whole of all the little pieces of paper you get left over from making a card. My new years resolution is to spend more time out in the nature and be more tidy :-). Have a nice day! My new years resolution is to do more exercise. Thanks for the chance to win. My New Year's resolution will be the same as previous years: live as best I can the way Christ would have me to live. I learned a long time ago that most of my resolutions never became reality, but this one does! I haven`t had resoutions until yet. My new year´s resolution is to spend more time to my crafting hobby and to better to use my pieces of spare paper. I love this handsome fella would love to ink him up :) New years resolutions always seem a good idea but never stick to them lol. Will try to budget what i buy in crafting goodies. and my new years resoution... I never make them because I broke them al last years before the first week of January is over. Love the charlie stamp, and wow, three chances to win. oooh gosh, I don't usually think about New Year's Resolutions before Christmas!!! There are the usual get fit ones but they never quite seem to work out!! However, last year, all my card making fell right by the way side and it's only in the last month or so that I've picked it up again, so my resolution this year should be to keep making cards at a regular rate in order to keep my hand in! My resolution will be to sing a tune each day. Oh ja, ich habe Spaß an Deinem Adventskalender. Du hast das so schön gemacht und die Preise sind ein Traum. Und selbst wenn man nicht bei den Gewinnern ist, macht es Spaß! Ich kann es übrigens kaum abwarten bis Du schon mal einen Ausblick auf die Januar-Kollektion gibst. Ich bin so gespannt!!! This is a great looking card! Charlie is ready to celebrate! My NYRes. is more exercise...actually get the whole family exercising more! Generally a healthier lifestyle! Keine Vorsätze die doch nur gebrochen werden. Die Karte ist wieder super schön. 4. To tidy up after each crafting session so that I am not constrantly spending my precious crafting time looking for something! New years resolution to enjoy life and make more cards. Beautiful card on todays advent calander. my years resolution? may be more study, more exams, and go on with university. I love this card! Gorgeous. My new years resolution is to buy lots and lots of scrapbooking an cardmaking stuff! Good resolution, isn't it? LOL! I never make a specific New Years-resolution, but if I would I'd say I want to enjoy life more. It goes by so fast sometimes. Gotta stop now and again to smell the roses! Hi another fantastic card! My new years resolution is to complete one scrapbook layout a week. Oh wow,ist das wieder eine wunderschöne Karte und wieder so ein toller Stempel! Wünsche allen einen schönen 3.Advent! Wieder so eine schöne Karte!!! My New Year's resolution is to organize my craft room. A really fab card!! He's really a handsome stamp, and he would fit perfectly on my new years eve cards and future party cards. I don't normally make resolutions, but I am going to keep in touch with family members on a regular basis and not let time get away from me so much. Ist ja Spitze die Idee mit dem Kalender...finde ich total klasse. My new years resolution is to find a job, since I was recently laid off. Great card, if I win it will be the first boy I have from Whiff of Joy. Thanks again for a chance to win. Krista P.
Wow what a great card. Many thanks for the opportunity to win this fab stamp. I never take any resolution but I have a dream for this year. I hope I will be able to open my scrpbooking store! Thanks to give us the chance to win this cute price! Gorgeous card from Camilla! My New years resolution is to finally get my bachelors degree. I´ve been putting it off for way to long. also, meine Vorsätze fürs neue Jahr: nicht mehr soooooo viel Schokolade und ein bischen mehr und regelmässig bewegen. I do like this card! Thanks for the 3 opportunity's this time! Katharina, thanks for the chance at winning this cute little guy. Love the card and this Charles Bond is just to cute. I don't make resolutions, they don't ever work. Mh ich möchte fürs Abi noch ein wenig mehr Gas geben in der Schule. What a fabulous and masculine card !! my new years resolution? To lose weight! My New Year's Resolution is to keep scrapping, even though my maternity leave is over and I will be working again. My New Year's resolution is to get more done in my scrapbooks... I have another child to scrapbook now! I have gotten to where I don't make a new years resolution any more that way I don't get disappointed in myself when I don't keep up with it LOL. Love this stamp. 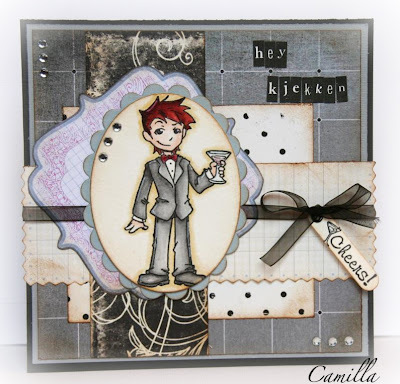 Love the card and the Charles Bond stamp...perfect for a New Years Card. My News Years Resolution is to live a healthier lifestyle. I am also making a resolution to make all my Christmas Cards for 2009. Love the card! DH is a huge James Bond fan and would love Charlie! My New Years resolution is to eat healthier this year. My new years resolution is to be a very good mother! I want to spend more time whith my to girls! WOW sieht die klasse aus ein Traum von Coloration und die Gestaltung SPITZE!!! Beautiful card. My news years resolution, mmm..... I think it will be to try and use up a lot of the stash I already have before buying more! Papers and embellishments etc not stamps I just couldn't stop buying them!! What a cute stamp I have not seen that one before. My new years resolution is to try and learn to drive. Eigentlich habe ich mir noch keine Gedanken gemacht. Ich freue mich erstmal auf Weihnachten. My new years resolution is to use up as much of my scraps as i can, as quickly as i can because i am running out of storage space and that wont do as i will have now space to put any new stuff next year lol. Mein Vorsatz fürs nächste Jahr ist, dass ich mehr spare und nicht mehr so viel ausgebe. Allerdings habe ich das dieses Jahr schon nicht geschafft ;)! My new years resolution is to not give up in finding a new apartment and hope for a great year for me, my family and friend's! Just adore Charlie. Well lets see eat less, craft more, and take the times to enjoy the little things. I think my resolution is going to have to be sorting out my craft area so I can make some space to work! Definetly yes, to loose some weight, and live healthier. A new years resolution? well, I don't normally make them. But I do try to resolve everyday to leave a smile on someone's face. What a wonderful card. Very debonaire (sp?). der 3. Advent ist ja leider gleich um. Dann wünsche ich Euch einen schönen Wochenbeginn! Vorsätze ? ich stelle mir keine fürs Folgejahr. Ich finde, jeder Zeitpunkt ist gut, mit etwas zu beginnen oder zu beenden. Absolutely fab card! He´s sooo handsome, Charlie!!! Don´t have any resolutions , prefer goals! - to be the best I can be, in everything I do! - to take the time to really see my boys, don´t want to wake up one morning feeling that I´ve missed something! - to join more challenges, since I think they are so much fun! - to try to get on a DT, that would actually be a dream! Thank you so much for all of these great opportunities to win, this is so much fun! Great card and I just love this stamp. No New Year's Resolution yet... I will be thinking about it now! Super cute card! Hmmm, my resolution would be to organize my scrapbooking area(and keep it organized)! Thanks for the wonderful opportunities to win these goodies! Charlie Bond kicks bootay! What a cute card! My New Years Resolution is to not eat ANYTHING out of a drive through. I also want to promise myself to walk 7 miles a week. Thanks for your beautiful advent calendar and lovely stamps!